This photograph shows the entrance to the Chain Pier esplanade, which followed the curve of the cliff to the Pier about ¼ mile away. 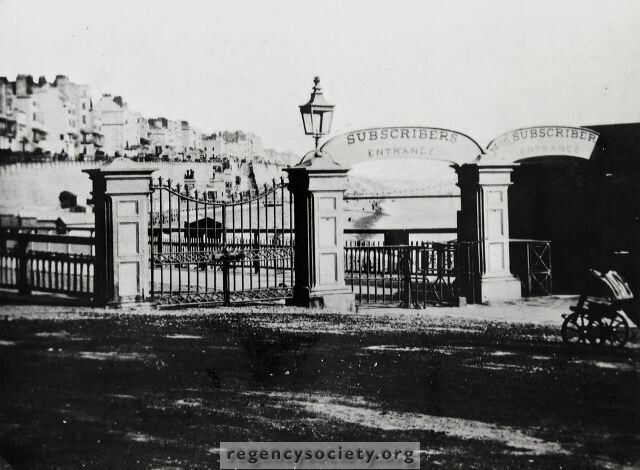 The tollgates were erected in 1824 and stood until 1871 when the original Aquarium was built on the site of the Esplanade. Later they were re-erected at Furze Court, Dyke Road Avenue and remained there until quite recent times. The photograph is a modern enlargement of an old one certainly dating from before 1871.